5. Kid's playground, tennis and basketball courts! 6. Free Seasonal shuttle to beach, Destin Commons, & Harborwalk Village. Palms Resort #2509 is a Junior 2BR/2BA, which is a 2 bedroom with a full sized master plus a smaller bedroom and two full sized bathrooms, one with a walk in shower. The master has a king sized bed with flat screen TV, the second bedroom has a trundle bed with 2 twins with a flat screen tv and its own bathroom entry. With a pull out sofa bed in the living room, this lovely unit sleeps 6! Look down at the pool or gaze at the Gulf from the large balcony. Gorgeous furnishings in the living area and your own washer & dryer complete this beautiful unit. The Emerald Coast of Northwest Florida is an amazing destination for your beach vacation! Sugar white sands and emerald green waters await. 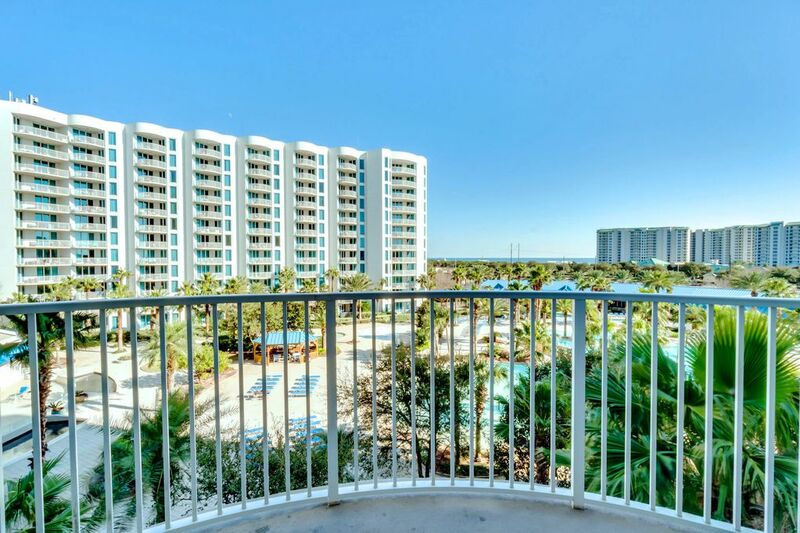 Whether your idea of relaxation is people watching on a beachfront balcony or being right in the middle of the action, we can help you find the vacation property that���s right for you. Our maintenance team, on call 24/7, and our friendly staff will help you to have a wonderful trip! The condo was perfect for my husband, my son and myself, nice layout, everything we needed was there, it had a great pool and water view. They were responsive to questions and the check-in was quick. The workout room was well-equipped and clean. We were there during spring break, so maybe our main complaints wouldn’t be applicable to other weeks, but the multiple security codes to any and all doors or gates, the security guy constantly patrolling and asking to see our wrist bands at the pool and work out room, really got annoying. Also, the WiFi was useless, even though we appropriately entered all the sign ins and passwords. We had to just use our data plan all week. The front desk said something was wrong with the cable and were of no help. So, really nice condo and amenities, but the over the top security and no WiFi would put a return visit on our part in doubt. Hi Ruth, thank you for taking the time to leave us a review of your stay. We’re pleased to hear the condo was perfect for your family and you enjoyed the great pool views. We would like to apologize for the inconveniences you experienced here. We are sorry to hear that the Palms staff was a bit exuberant in enforcing spring break policies. They are managing a huge building so have to be strict out of necessity. We did some checking and couldn’t find where you had contacted us regarding the Wi-Fi. We will forward your comments to our Operations Dept. to assess. Again, thank you for your feedback. Hi Kristy, thank you for your feedback on your stay at this lovely condo. We’re happy to hear you found the room clean and we hope you enjoyed the many amenities the Palms has to offer. Thank you again for your feedback and thank you for staying with Real Joy! We had a great time. Condo was very nice and well kept, would stay again! Hi Regan, thank you for your feedback on this lovely condo. We are pleased you enjoyed the well kept unit and hope you relaxed in the huge lagoon style pool as well! Again thank you for your input and choosing RealJoy as your rental provider! One thing you might look into. Although preference the master bed was quite uncomfortable. Hi Chad, thank you for your feedback on your stay at this lovely condo. We’re pleased to hear you found the unit clean and comfortable and enjoyed the amenities. We will forward your comments to our Operations Dept. to assess. Thank you again for your feedback and thank you for staying with Real Joy! Hi Kawan, thank you for your feedback on your stay at this lovely condo. We’re happy to hear you enjoyed your stay and found everything beautiful and we hope you enjoyed the awesome lagoon pool! Thank you again for your feedback and thank you for booking with Real Joy! The condo was great everything you need even a washer and dryer to wash all the beach/pool items everyday. The pool was perfect for children. I know other reviewers complain about the parking garage being a distance, and it is, but it's just how the condo complex is set up, so its a distance for them all. We didnt mind though. The only suggestion I would have is to have a slide and lock for the main entry door. For a condo that has children, it would have been very easy for my 2yr old son to escape. The extra protection would have been nice. We had to place a chair in front of the door since his room was right next to the entry way and would be very hard to hear him up from the Master room. Also there are not coffee filters for the pot, so we left the ones we bought behind. And simple things like salt and pepper. Also bring Laundry detergent if you plan to use the washer. But really no complaints, just suggestions for a easier vacation. Everything was great and clean and most likely we will return. Hi Michelle. Thank you for your feedback on your stay at this lovely condo. We’re happy to hear you found this unit great and had everything you needed during your stay. We’re happy to hear you enjoyed the pool area and found it great for the kids! We value your referrals and hope you will come back to see us! We will pass along your recommendations to our property management team to assess. Thanks again for your feedback and thank you for staying with Real Joy!